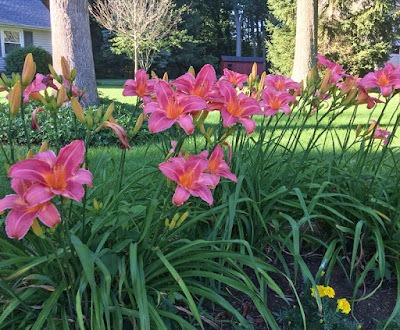 For the past 2+ weeks our Salmon Daylilies have blossomed! Suddenly, each morning there were 36+ blossoms to enjoy. Every vibrant color of summer flowers are always a welcomed sight! 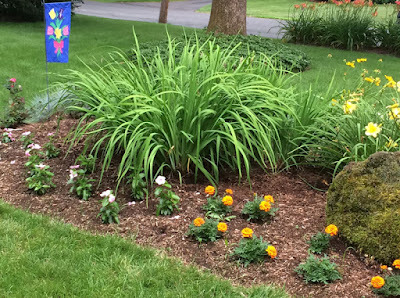 Some are perennials & a few others are annuals. The Irises already blossomed, but the graceful green foliage add another shade of green to our lawn. 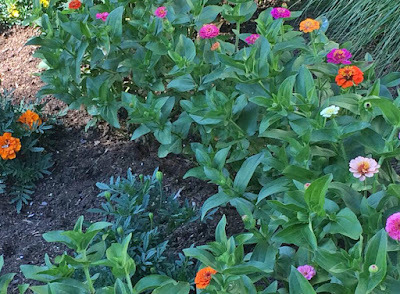 The saved Zinnia seeds were planted this spring. 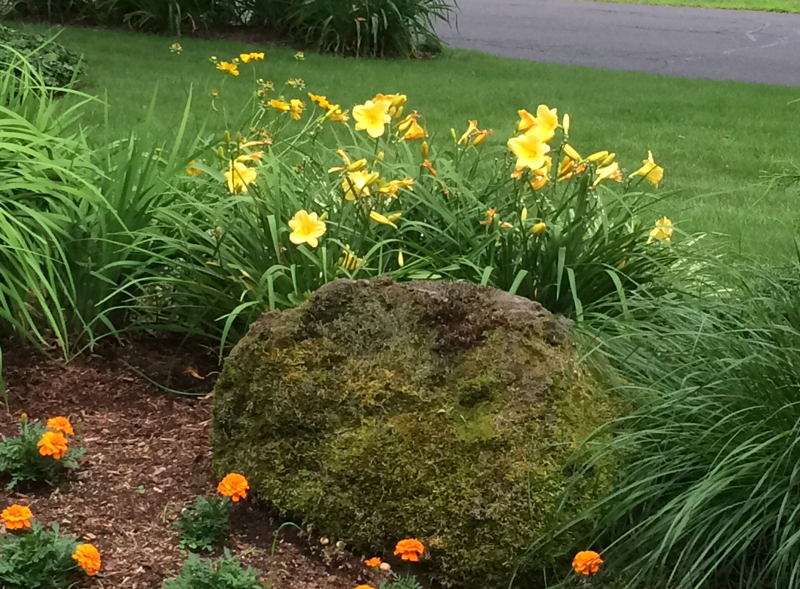 Now, they are beginning to blossom. Each week the view is a bit different, but always colorful & filled with flowers! July & Blueberries go hand in hand! It's the month when I purchase the locally grown berries from Calabrese Farms in Southwick, MA & prep them for our freezer. 3 quarts are always saved to make Blueberry Freezer Jam the next day. It's a tradition with me. In my mom's kitchen we made the cooked jams, but years later I learned about the easy to prepare freezer jams. That's my "go to" method! 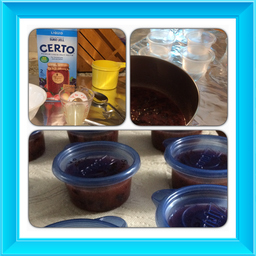 Certo (liquid pectin), sugar & lemon juice are the other ingredients I use. The complete directions are found in each box of Certo. My 1 cup Ziploc freezer containers are located & my kitchen becomes a jam kitchen. A certain amount of blueberries are crushed & added to sugar. They are stirred & the process begins. It's always handy to have all the ingredients, utensils & containers/ lids ready to use. Time just flies by after you set the timer. On Monday evening 3 batches of Blueberry Freezer Jam were sitting on our dining room table for the 24 hour time period. ***Always prepare only 1 batch at a time. 24 hours after the lids are placed on the top (& labelled/ dated) the jams are frozen. My additional hints for freezer jams. Do you prepare Freezer Jams? So delicious! We'll enjoy it all year! When preparing dinner I usually take out my iPad, place it on my kitchen counter & cook- using recipes on my blog or others I've saved. 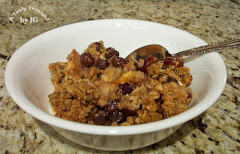 There are countless yummy foods that I've posted that we like. The ingredients are usually on hand, too. Now, it's the time of year to BBQ! Zucchini is a veggie that we like sauteed, but during the warmer months it finds a place on our grill whenever we're grilling dinner. Oregano, Basil & Garlic Powder added to the Baking & Sauteing Olive Oil give that veggie great flavoring! Usually 3 or 4 Zucchini are prepared. They are so good! One of the Grilled Zucchini are not eaten at dinner. It's saved for Tomato & Grilled Zucchini Salad the next day! 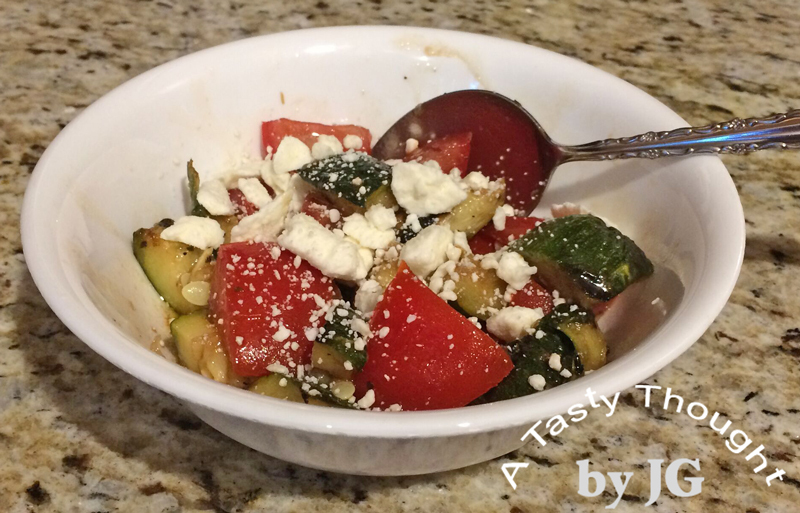 This cold salad is just yummy with a little Balsamic Vinaigrette drizzled on top! Cut Grilled Zucchini into slices. Drizzle Balsamic Vinaigrette on top. It's a delicious cold salad! Last year I learned of a beautiful oil painting by Norman Rockwell when I attended a lecture given by Tom Daly from the Norman Rockwell Museum (in Stockbridge, MA.) 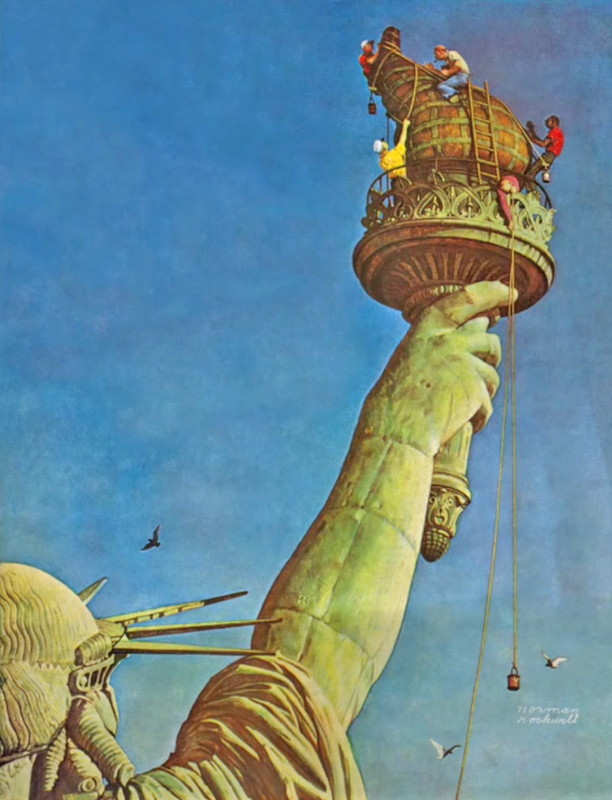 "The Statue of Liberty" is a different view of our beloved Lady Liberty. 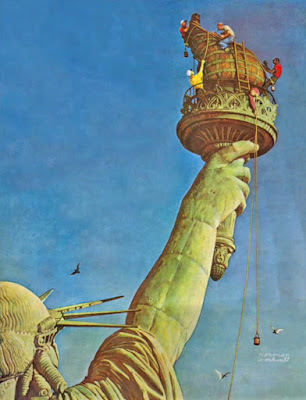 On July 6, 1946 this was the cover of The Saturday Evening Post. The men of different backgrounds are all working together to repair her torch. The oil painting was once owned by the film director Steven Spielberg. In 1994 he donated it to the official White House Collection. One day last year while watching the national news on t.v., I saw this beautiful work on display in President Barack Obama's Oval Office.